Tom DeFanti and Copper Giloth are each a recipient of this year’s SIGGRAPH Outstanding Service Award. DeFanti has been an inspirational executive committee member and conference contributor, helping create many of the organizational activities and conference venues that we now take for granted. Giloth’s dedication to her vocation, computer art, and to SIGGRAPH, enabled her to launch the conference’s first Art Show and grow it into an internationally acclaimed annual event. While DeFanti and Giloth are being honored separately, we acknowledge that they are also contemporaries. With enthusiasm and hard work, they supported and inspired one another over the years, and contributed to SIGGRAPH’s international stature. We appreciate this opportunity to publicly thank them for their outstanding service to SIGGRAPH. From SIGGRAPH’s first conference in 1974, DeFanti championed video as a communications medium for science and art, started the annual Film and Video Show (which subsequently became the Electronic Theater and is now the Computer Animation Festival), helped architect the conference’s outstanding audio/visual environment, and was founder (and still is editor-in-chief) of the SIGGRAPH Video Review (SVR). He served on the SIGGRAPH Executive Committee for 12 years. During his four-year tenure as Chair, DeFanti provided leadership as the organization and conference blossomed in quality and attendance. DeFanti built a sand box and invited his scientific, engineering and art friends to play, providing encouragement and seed money for new, special projects. He elevated SIGGRAPH to international stature by cooperating with computer graphics organizations in Europe and Japan. In 1987 he co-edited the landmark Visualization in Scientific Computing publication. For SIGGRAPH 92, he co-created and introduced the projection-based CAVE(tm) automatic virtual environment to hordes of screaming fans. Most of all, DeFanti continues to inspire others, particularly the students of the Electronic Visualization Laboratory at the University of Illinois at Chicago, feeding new ideas and energy into the life blood that is SIGGRAPH. DeFanti has a BA from Queens College and a PhD from The Ohio State University. He is co-director of the Electronic Visualization Laboratory at the University of Illinois at Chicago. When asked what SIGGRAPH activities she was most proud of, Giloth pointed to the design and implementation of the first SIGGRAPH 82 and 83 juried art shows and traveling art shows. Prior to 1982, there had been a few computer art exhibitions, some of international renown, but none that would match the size and scope of the shows that SIGGRAPH eventually launched. Art works from SIGGRAPH 83 traveled to France, Italy, Canada, Japan, and the US. The art show became more than a showcase for artists; it changed corporate culture. It showcased artists who could use technology, and use it in novel and unique ways that made them a vital force in the computer graphics industry. 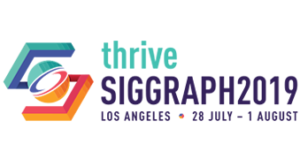 Giloth contributed to the SIGGRAPH organization and conference in additional ways, volunteering for several years as a member of the A/V team and helping produce the SIGGRAPH Video Review (SVR). For several years she applied her conference A/V and organizational skills to SIGGRAPH’s sister organization, SIGCHI, helping them achieve the same high standards people came to expect at SIGGRAPH’s annual conference. She applied her knowledge of the SVR to co-produce the Interactive Index of all the SVR issues. Giloth also served as the organization’s Special Projects chair for three years, evaluating proposals and providing seed money for worth-while projects. And, for 10 years she was the Cover Editor of the SIGGRAPH newsletter, and worked with artists to select images that would reproduce well in black-and-white. Most of all, however, Giloth has been the Grande Dame of the art show, formally and informally helping to ensure its continued success over the years. As with all volunteers, Giloth has found the time to be a participant as well as an organizer, and exhibited art, published videos in the SVR, and was a member of the winning team of the SIGGRAPH 94 College Bowl. Giloth has a BFA from Boston University and an MFA in electronic visualization from the University of Illinois at Chicago. She is currently an Associate Professor of Art and the Director of Academic Computing at the University of Massachusetts at Amherst.